To begin: Elan Noon is Keenan Mittag-Degala’s solo project. 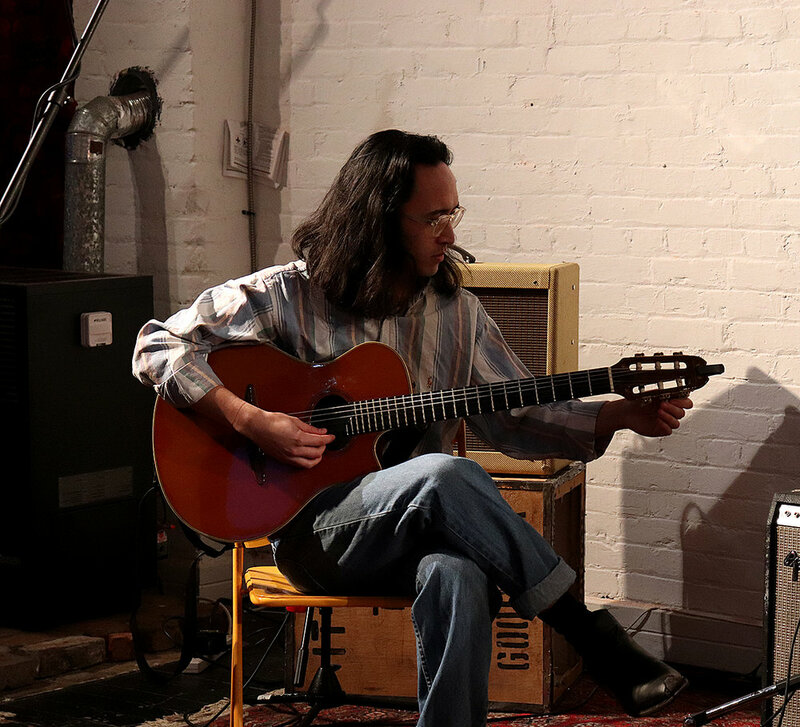 Let me immediately contradict that statement: When Keenan settled into the Chinatown loft in early March, he was joined by fellow Jons bandmate David Perry. These dreamy folks played through a set of dreamy jazz-folk, consisting entirely of new, or at least as-of-yet unreleased, Elan Noon songs. Not one track from 2017’s Have a Spirit Filled! But that’s perfectly fine. If all music is folk music in the sense that it’s played by “folks”, then this is definitely jazz too, in the sense that it’s played by . . . okay, that analogy doesn’t quite hold up, but bear with me here. Their first song of the evening, the warbling “Everybody’s Watching”, begins with a descending series of cluster chords before Keenan’s raspy falsetto pitches a series of questions to the listener. 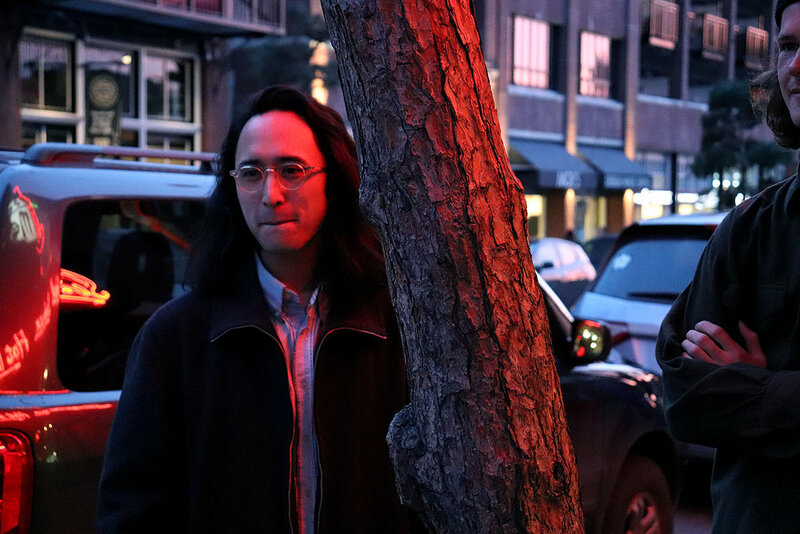 Elan Noon consistently bury the hidden math of jazz under an approachable indie-folk outlook. The lyrics seemingly outline a naive but magnetic subject, one who doesn’t know how strongly they draw the eyes of those around them. And that falsetto jump! Wild. “Tricky Mother Nature” packs more ten-dollar words into its brief two verses than this writer is comfortable trying to match. But it never even once hints at pretension! There's a discerning ear at work here for how much weight each line can hold lyrically. The chords themselves are indeed “tricky”, but so too is Nature’s role in the gender stereotypes this song seems to confront. Or am I reading that wrong? The third song, “Colour Glasses” makes reasonable requests of a person seemingly no longer in the narrator’s life. “Think of me once in a while” . . . a modest request, and one well-paired with the hypnotic but sharply written folk song. Is it a seance or perhaps a text to an ex? The ambiguity is an asset here. And have I mentioned how warm this all sounds? If there’s a through line to be drawn between Keenan’s work with Elan Noon and Jons, it’s in the lo-fi tape delay/saturation that gives both projects their distinct flutter and drifting quality; a thermal blanket at a breezy evening beach fire. The last piece, an untitled instrumental, churns and bounces along with exploratory, spacey chords before settling on a dissonant bent note. “Untitled” is the perfect summary of the previous three songs: resignedly curious and yes again, warm, but with a hint of something more sinister just below the surface. It could be jealousy; it could be world-weariness, but it’s gone before you can settle on which one, or if it’s even there at all.